One of San Francisco's simple pleasures is a cup of Irish Coffee at the Buena Vista Cafe. It's something the residents and locals alike have been enjoying since the 1950s. It may not have originated in the City by the Bay, but it's undoubtedly a San Francisco treat that you can enjoy during your visit, especially if it's foggy or raining. According to Cocktail Times, the Irish Coffee was first served at the Port of Foyne, a busy Irish air hub in the 1930s and 40s. After a flight was forced to turn back to Ireland during inclement weather, Chef Joe Sheridan offered the passengers a whiskey-laced coffee drink to warm and cheer them up. Perhaps not realizing their warming beverage contained alcohol, they asked if it was Brazilian coffee, In reply, Sheridan quipped: "that's Irish coffee." 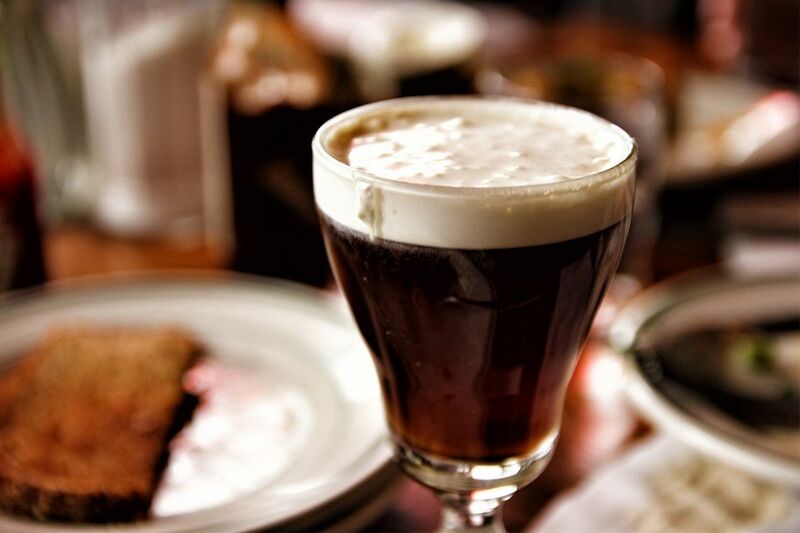 It took another 30 years for Irish Coffee to make its way to the USA. When you take your first sip, toast San Francisco Chronicle Travel columnist Stanton Delaplane and local barkeeper Jack Koeppler of Buena Vista Cafe who teamed up to bring the drink to California. The whole story is below and well worth a read to find out how much more difficult that was than it sounds. The Buena Vista Cafe has served tens of millions of Irish Coffees, and they keep making them at the rate of a quarter million a year. So many that their bartenders know how to turn them out in tandem by the scores. The cafe's most popular offerings are the Irish Coffee (made with real Irish whiskey), Bailey's Irish Cream Coffee and the Godiva Chocolate Coffee. Cozying up to a cup of it is one of the best ways to spend a rainy day in San Francisco. With all that history and thirsty journalists and bloggers writing about it, it's not surprising that the Buena Vista is always busy. You can find a seat at the bar to watch the bartenders making the drinks by the dozens, or walk up to any table with empty chairs and introduce yourself. They also serve food, but that's not their specialty, and you might be better off finding your meal somewhere else. From all the hoopla, you might think that the Buena Vista is only one place in San Francisco to get an Irish Coffee, but there are more according to Foursquare. You can also get frozen Irish coffees and Irish coffee gelato around town, but it's better to go for the original, warm one. One of America's favorite Irish imports made its way from Ireland, not on a boat, but by air, landing first in San Francisco. In 1952, Pulitzer-prize-winning San Francisco Chronicle travel columnist, Stanton Delaplane, was in an airport bar in Ireland. He was served a warming drink containing coffee, Irish whiskey, and cream. He must have liked it. After he got home to San Francisco, Delaplane told Jack Koeppler of San Francisco's Buena Vista Cafe about it. Koeppler set out to reproduce the concoction. After repeated failures, a trip to Ireland to unravel the secret of floating cream on hot coffee and an appeal for help from the mayor (who also owned a dairy), Koeppler began serving the Buena Vista’s now-famous Irish Coffee. To say it was a success is an understatement. The Buena Vista Cafe opened in a former boarding house in 1916, and its name is taken from the Spanish words for "good view." For more than a hundred years, locals and visitors have been imbibing at this watering hole that sits just above the end of the Hyde Street cable car line and a block away from Ghirardelli Square. And after all those years, they still have a good view, over the cable car turnaround and Aquatic Park. And if all that wasn't enough trivia for you, the Buena Vista is featured in the opening scene of the film When a Man Loves a Woman starring Andy Garcia and Meg Ryan. If you can't wait until you get to San Francisco to have one, see how Buena Vista does it. Buena Vista Cafe is at 2765 Hyde Street near the Hyde Street cable car turnaround and Ghirardelli Square. If you're already at Fisherman's Wharf, it's a one-block climb up Hyde Street from Jefferson to the Buena Vista at Hyde and Beach. If you're at Union Square, take the Powell-Hyde Cable car. You'll find the Buena Vista just before the end of the line.